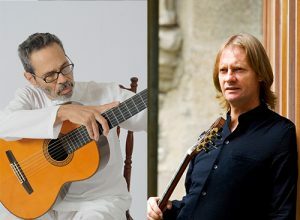 This summer, the world’s greatest guitarists will gather in the heart of London featuring the inestimable David Russell and the legendary Leo Brouwer. Join these guitar heroes and more for our four-day festival and summer school offering concerts, masterclasses and lectures. Kings Place is an amazing venue featuring two world class concert halls, state of the art workshop spaces & recording facilities, spacious public spaces, a waterside restaurant, a cafe and bar situated right in the middle of Europe’s biggest transport hub, minutes away from the Eurostar terminal, mere hours away from Paris and most UK destinations. Take advantage of this unique chance to study for four days with these amazing greats of the guitar, hear them play, spend time with them and other guitar enthusiasts, and perform yourself in the final student concert, be part of THE ultimate guitar experience! For booking any of the following concerts, or the classical course, please visit the Kings Place website here. 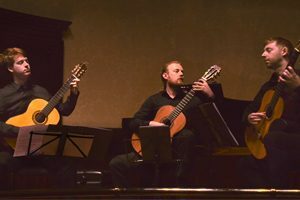 Made up of experienced and award winning postgraduate students from the Royal College of Music and Trinity Laban Conservatoire of Music and Dance, What Guitar Trio formed with the goal of promoting, specializing and augmenting repertoire for three guitars. Since its inception in early 2016 the ensemble has performed in some of the most prestigious venues in the country, including Barbican and the Wigmore Hall. An important focus for What Guitar Trio has been the enthusiastic promotion of contemporary music. Today’s concert features a new IGF Commission by Graham Lynch. The concert will start with the Housden-Tarlton Duo and the Andrea Vettoretti Quartet after the interval. 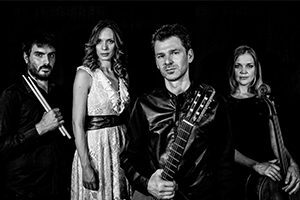 This exceptional show retells the story that conquered millions of people around the world through the magic of Andrea Vettoretti’s guitar. Andrea is one of Italy’s foremost guitarists and composers and this special project features his new especially composed music celebrating the wonderful story of Alice in Wonderland. Immerse yourself in the magical sound and light world of Wonderland. Don’t miss this guitar event with a difference! Jiva Housden and George Tarlton formed the Duo in 2012 while studying at the Guildhall School of Music and Drama. Both were scholarship students tutored by Robert Brightmore and David Miller and thrived during their time there, taking every opportunity to play with other instrumentalists, including chamber groups and orchestras. 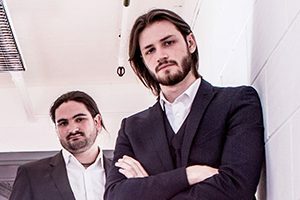 Jiva and George have performed across the UK, including at the Stogumber Music Festival and the London Music Festival and renowned UK venues such as Kings Place, the Barbican and most recently Milton Court. Concert features a new IGF Commission by Errollyn Wallen. 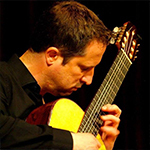 David Russell is one of the giants of the classical guitar today. 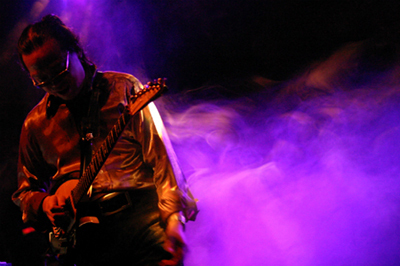 His beautifully polished and refined playing have made him a hero to guitarists and audiences the world over. 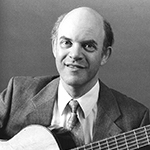 His many recordings for Telarc have met with tremendous acclaim and numerous awards including a GRAMMY. 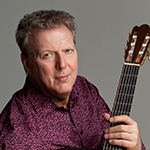 David is highly sought after and tours the world continuously, this is a rare chance to see the world’s foremost classical guitarist in concert. The course is run in a masterclass format where one student plays for the tutors listed below. Full course players will receive three 30 min lessons and can submit three choices of tutors of which we guarantee one. 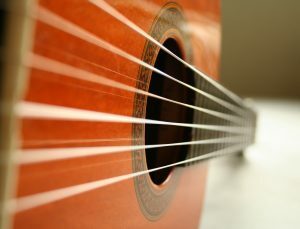 Participants on the full course can also participate in the guitar orchestra and the student concert and attend the evening concerts for a saver ticket. Booking generally is run on a first come, first served basis. 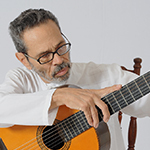 Brouwer is one of most significant musicians associated with the guitar of our time.His work as a composer, performer and conductor has earned him not only legendary status in the world of the guitar but also in the mainstream. 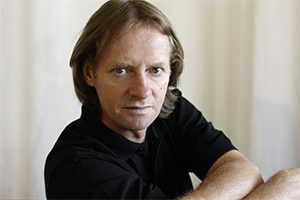 As a composer of some 350 works he has written for musicians such as Yo-Yo Ma, Andreas Scholl and Julian Bream and as a conductor he has worked with the world’s greatest orchestras including the Berlin Philharmonic. This is a unique chance to study with the 79 year old maestro in the UK. Russell is one of the greatest guitarists of our time and the one of the most sought after tutor of the instrument. His performances are justly famous for his exceptional technical mastery and artistic intelligence. As a tutor David is renowned for his patience, understanding and ability to give each student bespoke and helpful instruction. Kerstens is one of the foremost figures in the world of the guitar in his role as performer, recording artist and artistic director of IGF. He specialises in new music and has commissioned 85 new works by leading mainstream composers. 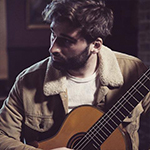 Lewin is Head of Guitar at the Royal Academy of Music where he has taught a large number of outstanding guitarists including Rafael Aguirre, Miloš Karadaglić, Xuefei Yang, Fabio Zanon and many others. 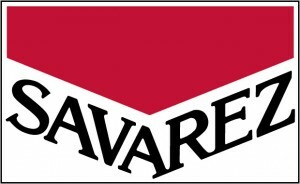 He is Chairman of the Ivor Mairants and New Elizabethan Awards administered by the Worshipful Company of Musicians, and a Freeman of the City of London. Stell is professor of guitar at the Royal College of Music. He has performed at some of the most prestigious festivals & concert series the world over including Wigmore Hall, Kings Place, Southbank Centre, 92nd Street New York, Omni Foundation San Francisco, Sage Gateshead, Uppsala Congress Hall, Beethoven Halle Bonn and Stuttgart Liederhalle. 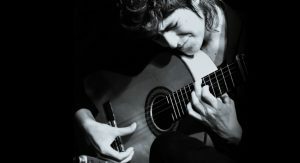 Rossi is one of the brightest young talents of the guitar. 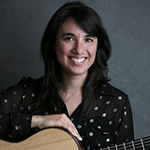 After studies in her native Argentina and Europe, she has won a number of prestigious international competitions including First Prize in London International Guitar Competition held at Kings Place in 2015.
studied at the Royal Conservatoire of Scotland, graduating with a Bmus (Hons) in Classical and Contemporary Guitar. 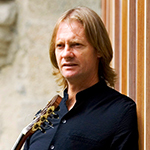 He has since then formed the Glasgow Guitar Quartet and has performed throughout the UK and Europe. ‘Nobody plays guitar like him,’ wrote the Frankfurter Allgemeine Zeitung newspaper about Nguyên Lê. Born of Vietnamese parents in Paris in 1959, Nguyên Lê is one of the most versatile, distinctive and independent guitarists in the world – going far beyond the bounds of jazz music and shaped by the most varied of influences such as Asian music, modern jazz, fusion or classic rock. The guitarist’s list of recording credits includes names such as Melanie C (Spice Girls), Hayley Westenra, Leanne Mitchell and Anna Leddra Chapman. 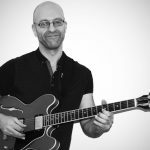 During his career he has worked with some of the finest musicians in the world, including Larry Carlton, Albert Lee, Scott Henderson, Brent Mason and Brett Garsed just to name a few. IGF will offer you the unique opportunity to study with the acclaimed jazz musician Nguyên Lê. As a self-taught musician, Nguyên Lê delivers a very personal approach in his pedagogic works. In this course he will try to transmit the ways he discovered the science of music by himself. As a Paris-born child of Vietnamese immigrants he grew up in a cross-cultural situation. From an early age he became fascinated by non-western cultures, which are part of today’s life in Paris. These influences are essential to Nguyên Lê’s style. He will show how to integrate the lessons of these cultures in playing and writing. From a very young age, Antonia Jimenez performed in Andalusian Flamenco clubs. She has accompanied singers such as the great Carmen Linares, and Juan Pinilla and dancers Olga Pericet, Belen Maya, Manuel Liñán, Marco Flores, Rocío Molina and others. 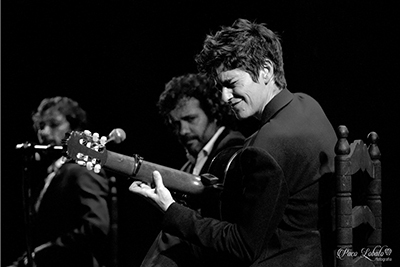 As a composer she wrote for Marco Flores’s show De Flamencas, created her own production Dos Tocaoras and won the award for Best Original Score at 2016 Flamenco Choreography Competition in Madrid. Last year’s Guitar Summit 2017 was a great success – please view the link here to see what we got up to.